The law I have just signed was passed to put people back to work, to let them buy more of the products of farms and factories and start our business at a living rate again. This task is in two stages; first, to get many hundreds of thousands of the unemployed back on the payroll by snowfall and, second, to plan for a better future for the longer pull. While we shall not neglect the second, the first stage is an emergency job. It has the right of way. The second part of the Act gives employment through a vast program of public works. Our studies show that we should be able to hire many men at once and to step up to about a million new jobs by October 1st and a much greater number later. We must put at the head of our list those works which are fully ready to start now. Our first purpose is to create employment as fast as we can, but we should not pour money into unproved projects. We have worked out our plans for action. Some of the work will start tomorrow I am making available $400,000,000 for State roads under regulations which I have just signed, and I am told that the States will get this work under way at once. I have also just released over $200,000,000 for the Navy to start building ships under the London Treaty. In my Inaugural I laid down the simple proposition that nobody is going to starve in this country. It seems to me to be equally plain that no business which depends for existence on paying less than living wages to its workers has any right to continue in this country. By “business” I mean the whole of commerce as well as the whole of industry; by workers I mean all workers, the white collar class as well as the men in overalls: and by living wages I mean more than a bare subsistence level– I mean the wages of decent living. Throughout industry, the change from starvation wages and starvation employment to living wages and sustained employment can, in large part, be made by an industrial covenant to which all employers shall subscribe. It is greatly to their interest to do this because decent living, widely spread among our 125,000,000 people, eventually means the opening up to industry of the richest market which the world has known. It is the only way to utilize the so-called excess capacity of our industrial plants. This is the principle that makes this one of the most important laws that ever has come from Congress because, before the passage of this Act, no such industrial covenant was possible. On this idea, the first part of the Act proposes to our industry a great spontaneous cooperation to put millions of men back in their regular jobs this summer. The idea is simply for employers to hire more men to do the existing work by reducing the work hours of each man’s week and at the same time paying a living wage for the shorter week. No employer and no group of less than all employers in a single trade could do this alone and continue to live in business competition. But if all employers in each trade now band themselves faithfully in these modern guilds–without exception- and agree to act together and at once, none will be hurt and millions of workers, so long deprived of the right to earn their bread in the sweat of their labor, can raise their heads again. The challenge of this law is whether we can sink selfish interest and present a solid front against a common peril. It is a challenge to industry which has long insisted that, given the right to act in unison. it could do much for the general good which has hitherto been unlawful. From today it has that right. Many good men voted this new charter with misgivings. I do not share these doubts. 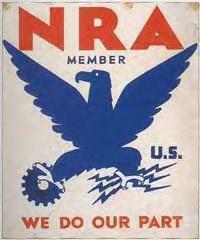 I had part in the great cooperation of 1917 and 1918 and it is my faith that we can count on our industry once more to join in our general purpose to lift this new threat and to do it without taking any advantage of the public trust which has this day been reposed without stint in the good faith and high purpose of American business. But industry is challenged in another way. It is not only the slackers within trade groups who may stand in the path of our common purpose. In a sense these groups compete with each other, and no single industry, and no separate cluster of industries, can do this job alone for exactly the same reason that no single employer can do it alone. In other words, we can imagine such a thing as a slacker industry. This law is also a challenge to labor. Workers, too, are here given a new charter of rights long sought and hitherto denied. But they know that the first move expected by the Nation is a great cooperation of all employers, by one single mass-action, to improve the case of workers on a scale never attempted in any Nation. Industries can do this only if they have the support of the whole public and especially of their own workers. This is not a law to foment discord and it will not be executed as such. This is a time for mutual confidence and help and we can safely rely on the sense of fair play among all Americans to assure every industry which now moves forward promptly in this united drive against depression that its workers will be with it to a man. It is, further, a challenge to administration. We are relaxing some of the safeguards of the anti-trust laws. The public must be protected against the abuses that led to their enactment, and to this end, we are putting in place of old principles of unchecked competition some new Government controls. They must, above all, be impartial and just. Their purpose is to free business, not to shackle it; and no man who stands on the constructive, forward-looking side of his industry has anything to fear from them. To such men the opportunities for individual initiative will open more amply than ever. Let me make it clear, however, that the anti-trust laws still stand firmly against monopolies that restrain trade and price fixing which allows inordinate profits or unfairly high prices. If we ask our trade groups to do that which exposes their business, as never before, to undermining by members who are un-willing to do their part, we must guard those who play the game for the general good against those who may seek selfish gains from the unselfishness of others. We must protect them from the racketeers who invade organizations of both employers and workers. We are spending billions of dollars and if that spending is really to serve our ends it must be done quickly. We must see that our haste does not permit favoritism and graft. All this is a heavy load for any Government and one that can be borne only if we have the patience, cooperation, and support of people everywhere. Finally, this law is a challenge to our whole people. There is no power in America that can force against the public will such action as we require. But there is no group in America that can withstand the force of an aroused public opinion. This great cooperation can succeed only if those who bravely go forward to restore jobs have aggressive public support and those who lag are made to feel the full weight of public disapproval. As to the machinery, we shall use the practical way of accomplishing what we are setting out to do. When a trade association has a code ready to submit and the association has qualified as truly representative, and after reasonable notice has been issued to all concerned, a public hearing will be held by the Administrator or a deputy. A Labor Advisory Board appointed by the Secretary of Labor will be responsible that every affected labor group, whether organized or unorganized, is fully and adequately represented in an advisory capacity and any interested labor group will be entitled to be heard through representatives of its own choosing. An Industrial Advisory Board appointed by the Secretary of Commerce will be responsible that every affected industrial group is fully and adequately represented in an advisory capacity and any interested industrial group will be entitled to be heard through representatives of its own choosing. A Consumers Advisory Board will be responsible that the interests of the consuming public will be represented and every reasonable opportunity will be given to any group or class who may be affected directly or indirectly to present their views. At the conclusion of these hearings and after the most careful scrutiny by a competent economic staff the Administrator will present the subject to me for my action under the law. I am fully aware that wage increases will eventually raise costs, but I ask that managements give first consideration to the improvement of operating figures by greatly increased sales to be expected from the rising purchasing power of the public. That is good economics and good business. The aim of this whole effort is to restore our rich domestic market by raising its vast consuming capacity. If we now inflate prices as fast and as far as we increase wages, the whole project will be set at naught. We cannot hope for the full effect of this plan unless, in these first critical months, and, even at the expense of full initial profits, we defer price increases as long as possible. If we can thus start a strong, sound, upward spiral of business activity, our industries will have little doubt of black-ink operations in the last quarter of this year. The pent-up demand of this people is very great and if we can release it on so broad a front, we need not fear a lagging recovery. There is greater danger of too much feverish speed. In a few industries, there has been some forward buying at unduly depressed prices in recent weeks Increased costs resulting from this Government-inspired movement may make it very hard for some manufacturers and jobbers to fulfill some of their present contracts without loss. It will be a part of this wide industrial cooperation for those having the benefit of these forward bargains (contracted before the law was passed) to take the initiative in revising them to absorb some share of the increase in their suppliers’ costs, thus raised in the public interest. It is only in such a willing and considerate spirit, throughout the whole of industry, that we can hope to succeed. Under Title I of this Act, I have appointed Hugh Johnson as Administrator and a special Industrial Recovery Board under the Chairmanship of the Secretary of Commerce. This organization is now prepared to receive proposed Codes and to conduct prompt hearings looking toward their submission to me for approval. While acceptable proposals of no trade group will be delayed, it is my hope that the ten major industries which control the bulk of industrial employment can submit their simple basic Codes at once and that the country can look forward to the month of July as the beginning of our great national movement back to work. During the coming three weeks Title II relating to public works and construction projects will be temporarily conducted by Colonel Donald H. Sawyer as Administrator and a special temporary board consisting of the Secretary of the Interior as Chairman, the Secretary of Commerce, the Secretary of Agriculture, the Secretary of War, the Attorney General, the Secretary of Labor and the Director of the Budget. During the next two weeks the Administrator and this board will make a study of all projects already submitted or to be submitted and, as previously stated, certain allotments under the new law will be made immediately. 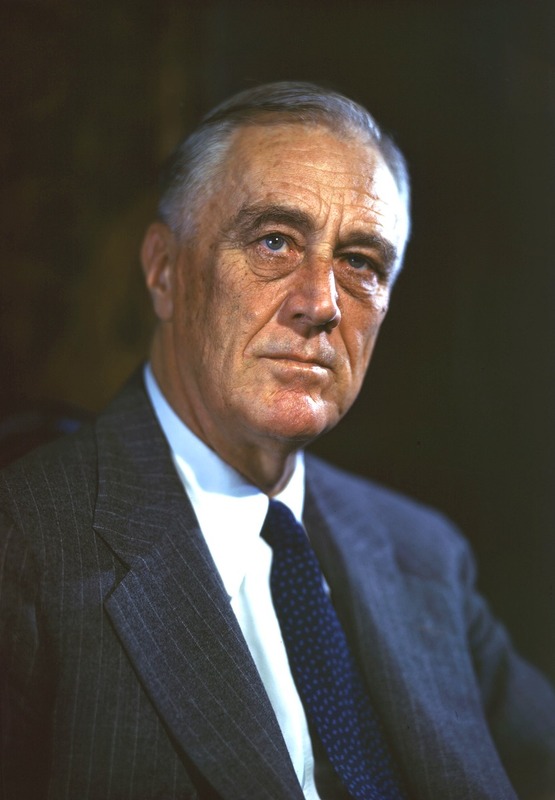 Source: New Deal Network: Works of Franklin D. Roosevelt — http://newdeal.feri.org/ Also Reprinted in The Public Papers and Addresses of Franklin D. Roosevelt, Vol. 2, 1933, (New York City: Random House, 1938), p. 251.